Keyword Density: Shoot for keyword densities up to 5% and you will rank high in search engines. I’ve no count of so called articles written for the sole purpose of serving as content for search engine spiders to feed on. Repeating the keyword/key phrase 25 times in a 500 word article looked awkward for me, but never for my clients. In one extreme case, I wrote some 100 articles for a self storage company. The purpose? Keyword density of 20%! In other words, I have to fit in keywords ‘city name self storage’ and ‘self storage city name’ in every sentence of the 750 word article I’d write. Replace the city name with New York, San Francisco, Los Angeles, etc and you have articles for dozens of cities in the USA. The client wouldn’t find it even if I use Ctrl+F to replace city names and create new articles. Although I never liked it, I could write 750 words in 20 minutes or less (a feat I could never repeat in other projects). 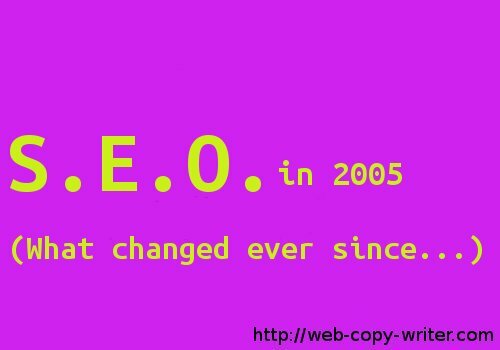 And, during those project, I thought the job of an SEO content writer is to create fodder for search engines to feed on. (Still, a lot of people think this is the way to go). Anchor Text: Get other websites to link to your site with specific keywords or phrases as link text. Anchor text was a big deal. Suppose you wanted your website to rank highly for the search term ‘natural acne cure’. You would ask other websites to link to your website with the text ‘natural acne cure’. If you get thousands of such links, your website would rank high for that search term. Even today, if you search the term ‘click here’ in Google, the first result is of Adobe PDF reader page. This is because, the thousands of pages that offer a PDF download link to Adobe’s site to download the software that helps you read a PDF file. (My personal preference is Foxit Reader though). Article Submission: Write a 300-word article and submit it to 100s of article directories. Almost everyone used this technique to get links. You can easily write an article. Then, from the resource box, you can place as much as three links to your website. The links can have any anchor text you want. Article submission is not dead. People do submit to article directories. However, more writers and bloggers now exchange articles with other websites and blogs in similar categories. Meta Keywords: Include all possible keywords in the keyword meta tag. Dump as many keywords as possible in the page’s meta keyword tag. It was possible to see 15 or more keywords appearing in the meta tag. Page Title: Use a descriptive page title. This technique remains constant from 2005 through 2013. The title in title tag is what people see in search results pages. The more descriptive the title tag, the better it is for a searcher to identify the right page. Alt Attributes: Use keywords in the alt attribute of img tags. Google and search engines can’t identify the image, unless you specifically tell them what it is. The alt=”a sunflower farm” would tell Google the image shows a sunflower farm. This still is a legitimate technique. The boring part is, people would dump a dozen keywords, where one would do.